Though Morocco’s largest airport, Mohammed V International, services Casablanca, the country’s capital is actually Rabat. Expect costs of $30-40 per day. Morocco doesn’t really experience a peak tourism season, but it does get crowded during European holidays. Temperatures in Morocco vary between -1˚C (30ºF) at the coldest and 32˚C (90ºF) at the hottest. 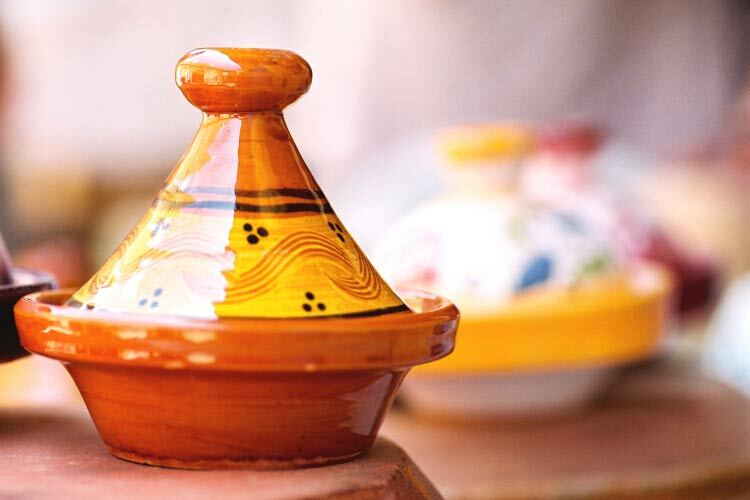 Ceramics and lanterns are the traditional Moroccan souvenirs. Located in the northwestern corner of Africa, the defining feature of Morocco is undoubtedly the mixture of cultures its citizens represent. The indigenous people of the country are called the Berber, and much of their customs have been preserved in the mountainous region in the southern portion of the country. Nearly 500 years ago, several Arabic dynasties took control of the region in succession, and even today Arabic and Islamic influences are omnipresent in Morocco. Furthermore, both France and Spain vied for influence over the country, due to its key position at the entrance of the Mediterranean. The French ultimately controlled most of the country during the early half of the 20th century, and Morocco wouldn’t earn its independence until 1963. Since then, the country has adopted constitutional monarchy and parliamentary systems, and controversially annexed the region of Western Sahara. Though Morocco has experienced civil uprisings and isn’t quite as democratic as most first world nations, it still holds a reputation as a fantastic place to travel and is often the most visited country in Africa. One of the main reasons Morocco welcomes so many tourists is because of its proximity to Europe, which leads to massive surges of tourists during Easter, Christmas, and other school holidays. 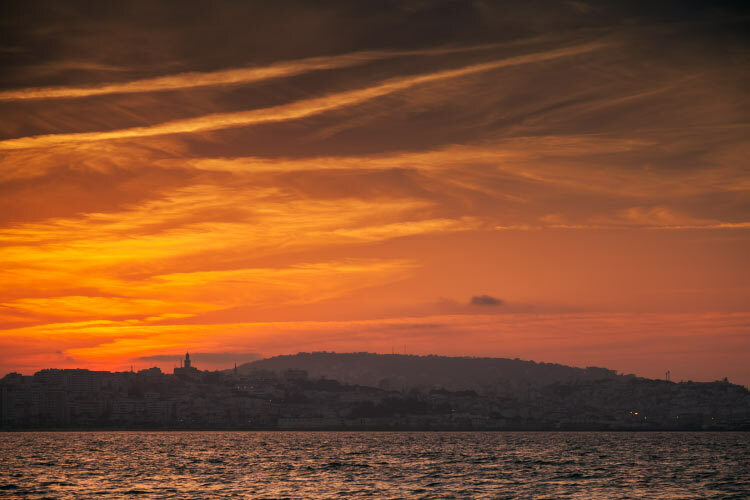 Less than 25 miles sits between the Moroccan city of Tangier and the Spanish coastline, and many tourist’s itinerary involve both these locations and nearby Gibraltar. Most of Morocco strongly adheres to Muslim rituals, and thus much of the country shuts down during Ramadan. This monthlong tradition begins in late June and runs through late July. During this time, Muslims fast during the day; for this reason, many shops and restaurants are closed for lunch the entirety of Ramadan. Furthermore, consumption of alcohol, tobacco, drinking liquids and sexual activity is prohibited. Foreign travelers are not expected to adhere to this custom, though its highly recommended to respect the tradition and not eat or smoke in public during Ramadan. The month of Ramadan is a very interesting time to visit Morocco, as the general atmosphere will be very different than the rest of the year. The month ends with Eid al-Fitr, a festive holiday usually accompanied by feasting. We’ve already mentioned the city of Tangier, but a trip to Morocco really benefits from time spent in this lovely city. Due to its location at the mouth of the Mediterranean, Tangier has welcomed travelers and tourists for many hundreds of years. In fact, the city was entirely independent from any nation up until 1956. Because of this, the city has developed a vibrancy and worldliness matched by few other destinations. In fact, most locals speak a unique combination of Arabic, French, and Spanish. Life in Tangier is best exemplified inside the Medina, a walled off section of the city dating back to the 1300s. In the evenings, the Medina comes alive with numerous street vendors, artisans, and a thriving nightlife scene. Although Tangier definitely qualifies as an “international city,” most of its citizens practice some type of Islamic beliefs and the city has a similar vibe to other Arabic settlements. Tangier isn’t the only city in Morocco with a breathtaking medina. In fact, most traditional Arabic cities contain a walled section meant to house their leaders during times of crisis. Another famous medina of Morocco is in Marrakech. 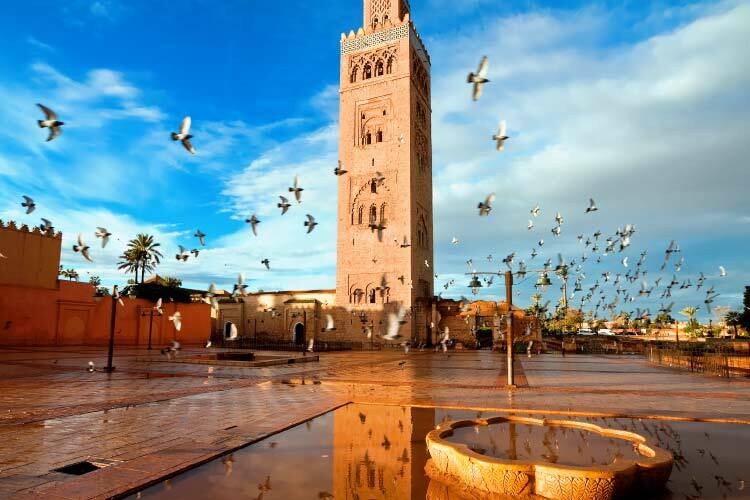 Situated at the bottom of the breathtaking Atlas Mountains, Marrakech features both its traditional Medina and a modern European district called Ville Nouvelle. The main square of the Medina is called Djemma El-Fna, which nearly always holds several concurrent street performances, often musicians, snake charmers, and acrobats. Travelers also enjoy venturing outside the city for a taste of Morocco’s rugged countryside. Unfortunately, Marrakech is the southernmost destination in Morocco’s otherwise fantastic public train system, so private drivers will be needed to venture into the mountains. 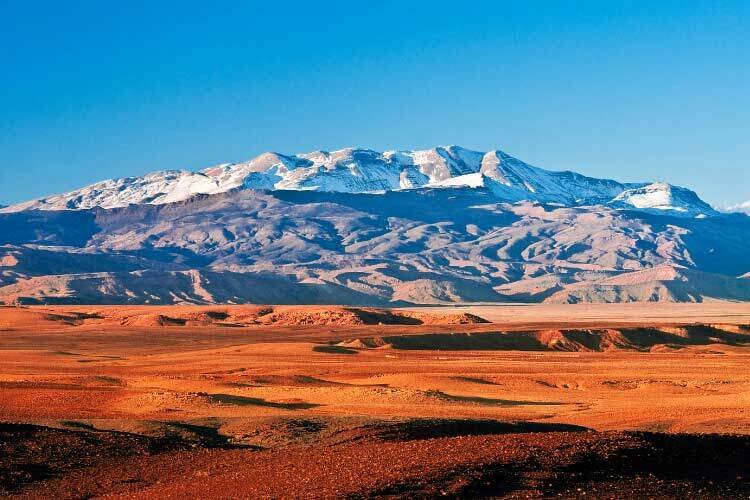 In complete contrast to the Atlas Mountains, Morocco also holds a sizeable portion of the Sahara Desert, though these two biomes actually sit quite close to each other. Ourzazate is probably the best base of operations for a Saharan trip. The city sits in the middle of an expanse of picturesque, barren sand dunes that look exactly like the stereotypical Hollywood desert. 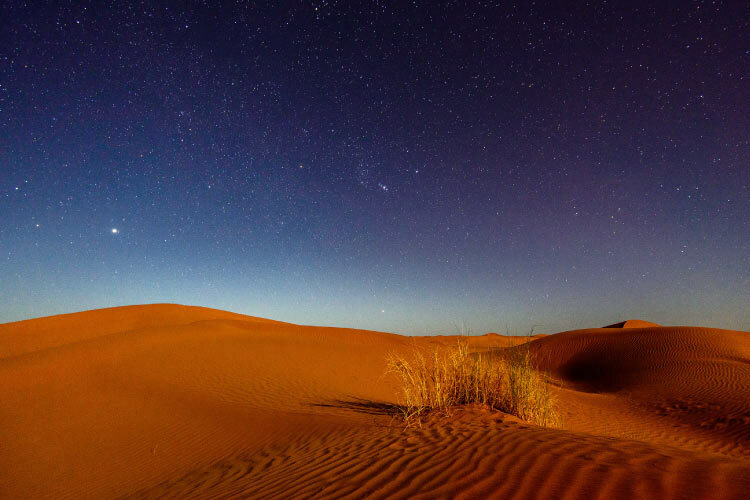 In fact, Ourzazate welcomes a number of film crews each year, and famous movies and TV shows like Lawrence of Arabia, Cleopatra, and even Game of Thrones filmed desert scenes outside the city. Numerous tours exist that take travelers through the sets of their favourite movies, often accompanied by screenings in the evening. 1. Catch a performance by one of the stellar local musicians in Oujda. Then, amble through the twisted alleyways of the central walled city to find dozens of street vendors peddling fantastic wares. Finally, head east to Parc Sidi Mâafa, a lovely national park containing a unique Mediterranean forest biome. 2. Fes (pictured below) famously holds Qarawiyyin University, the world’s oldest university. However, the town itself also offers street shopping, performances, and other entertainment options. Watch talented artisans in the city’s tanneries, who still prepare leather using techniques discovered hundreds of years ago. 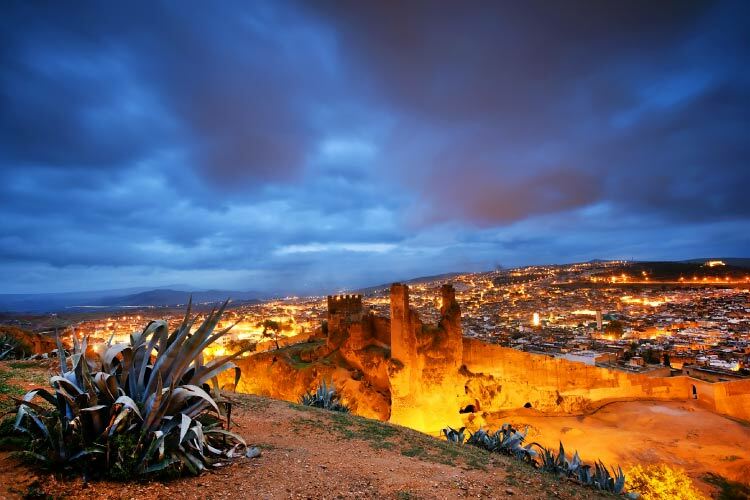 For dinner, be sure to choose a restaurant with a rooftop terrace, as the sunset over Fes is quite spectacular. 3. The Caves of Hercules outside Tangier is not only an important mythological site, but also contains some stunning archaeological wonders. Alternatively, one could relax on the beach near Tangier, Ave Mohammed VI, preferably with one of the city’s famous mint teas within reach. Most of the city’s famous historical sites, including the Kasbah and American Legation Museum, are within walking distance of the beach. 4. Rabat is known as both the cultural and political capital of Morocco, and a trip to the city wouldn’t be complete without catching a theatrical performance, preferably by a street performer or at the Théatre Mohammed V. The city also holds the National Archaeological Museum, Hassan Tower, and the Royal Palace (which is not very tourist friendly). Be sure to investigate Chellah, an abandoned city near Rabat once held by Romans and Arabs, and now occupied by an enormous number of birds! 5. Casablanca, which most people refer to simply as Casa, holds several great travel destinations, including the Turkish bath Hammam and the enormous King Hassan II Mosque (the world’s third largest mosque). The Shrine of Sidi Abderrahman is also stunning, though only Muslims may enter the Shrine itself. Casablanca is also famous for its nightlife, with clubs, bars, and venues throwing huge parties every night until sunrise. 6. The Palmeraie is a charming refuge outside of Marrakech containing over 15,000 palm trees. Next, explore the ruins of El Badi Palace, which includes fascinating underground tunnels, or alternatively visit the intact El Bahia Palace for a better glimpse of 1800s Morocco. At night, be sure to visit bustling Djemma El-Fna square in the centre of the Medina. 7. Agadir is primarily known for its gorgeous beaches and desert-like surroundings. Many national parks circle the city, whereas numerous resorts occupy the beaches. Surfing is very popular in Agadir, as well as golf. Be sure to purchase fresh fish and handmade crafts from the numerous street vendors. A portion of Agadir’s old fortress, which was destroyed hundreds of years ago, still sits on a hill overlooking the city.